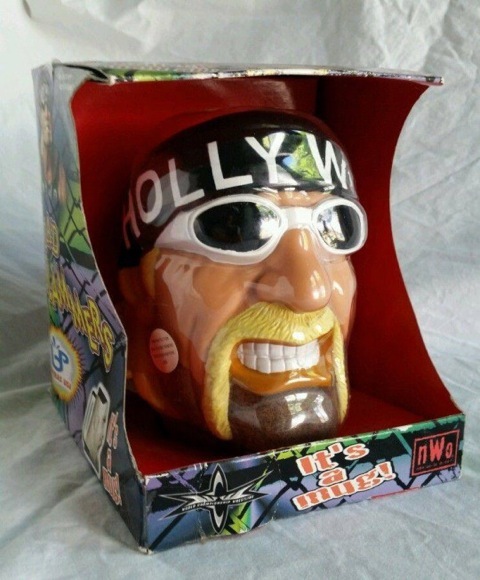 Someone Bought This: Hollywood Hogan face mug - WrestleCrap - The Very Worst of Pro Wrestling! Why WOULD someone drink out of this? Proof that you have finally taken down an immortal? I dunno… Maybe someone who wants to pretend that Hulk Hogan’s head is full of delicious Hot Cocoa? 9 Responses to "Someone Bought This: Hollywood Hogan face mug"
WCW really took copywriting to new heights. Where the big boys play. Rules and bones are made to be broken. That voice changer device that Ole Anderson liked so much? If only Acme made an ad copy version. They needed it. I’m glad they cleared it up but stating that thing is a Mug. I mean it is Hogan’s face, and mug is a slang term for unappealing face so maybe they were onto something with this product. I am also curious to know what it says on that white sticker thing on the side of his beard. Imagine if Hogan walked around with that during his NWO prime. I think that was a missed opportunity for sure. So let me get this straight. You’re saying this is a mug right? 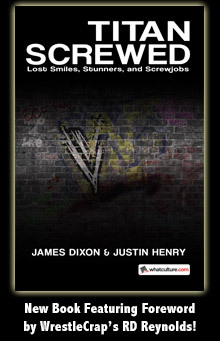 Lex Luger had one but it came after he was arrested and was photographed (a mug shot).